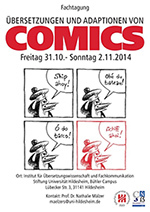 “Up to the present day translation studies have paid little attention to Comics. There are many possible reasons for this. Research within the discipline has for a long time almost exclusively focused on verbal texts. On one hand, since the 1990s it had devoted more attention to audio-visual texts, but a clear emphasis has been with those inter- and intra-lingual forms of translation which are required by films. On the other hand it is much harder to differentiate comics clearly from other text types, regardless of whether comics are seen as a genre, a distinct communication medium or as a hybrid collection of signs. Finally, comics have been regarded – especially in Germany – as unserious, and this undoubtedly has meant that they have been discussed in peripheral areas of literary criticism, media science and translation studies. Attendance at the conference is free. Please register though via email!